Ok, I dig Twitter and I understand why celebrities – who continue to flock to the service as if their careers and social status depend on it – manage to attract massive amounts of users following their every 140-character move, but this is getting plain ludicrous. 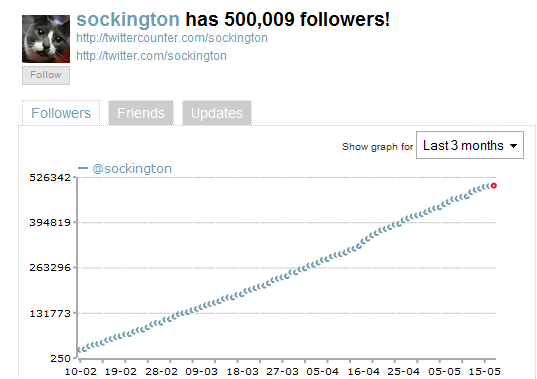 Meet @Sockington, a cat on Twitter that has succeeded in surpassing the 500,000 follower mark some time yesterday. Tweeting eye-opening messages such as “and so I slept and then I walked around and then I slept again and then I saw a cobweb and OH FINE YES IT IS A SLOW NEWS DAY” in addition to “HOORAY THE ATTIC IS OPEN awesome view from attic window PLUS I PROVIDE CREEPY CAT SHADOW IN TOP WINDOW wooooooooooo look out socks above”, the cat has gone from a couple hundred to half a million followers in about 3 months, as the account’s TwitterCounter stats depict. 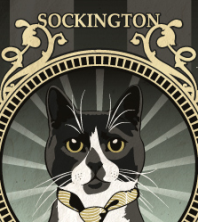 Meanwhile, Sockington (aka Socks aka Sockamillion) has his own website, and some members of the group of followers – which now even have their own name, Socks Army – are buying T-shirts with the animal’s tweets printed on them. The pet’s owner, Jason Scott, is even getting interviewed (repeatedly) and speaking at events about the Twitter account. Maybe it’s because I’m not really a cat person, but this is beyond me. People have been saying Twitter has jumped the shark for quite a while (that started around the time the startup launched, actually) and I’ve always felt those people were completely missing the point. But honestly, a cat attracting 500,000+ users with this nonsense is utterly incomprehensible from where I’m standing. Meow me your thoughts in comments.